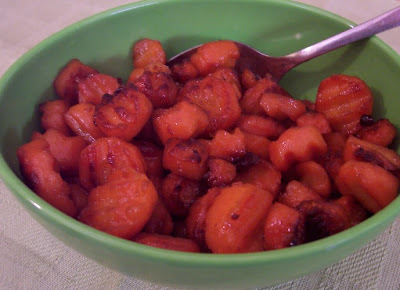 This is a dairy free version of my mother-in-law's frequently requested glazed carrots. She says the secret is to "burn them a little bit." Wash, peel, and slice carrots or use precut baby carrots. Steam or boil until soft, but not mushy. Drain if boiled, then place in heavy bottomed pot with margarine and brown sugar. Cook over medium high heat, stirring occasionally, until edges are noticeably brown.